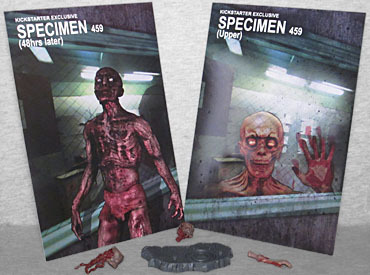 As mentioned in today's review, Zombie 459 has two variants. 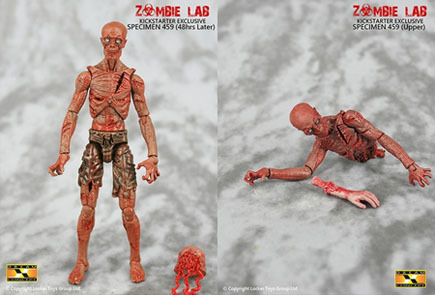 The Zombie Lab Kickstarter, like many, offered several exclusive figures that wouldn't be available outside the initial campaign - mostly bloodied versions of the human characters, but also two different takes on 459. First, there's figure #E001, "Specimen 459 (48hrs later)." From the neck down, it's the same as the standard: same torn pants, same dried body, same muddy, unappealing paint. The prototype image made him look a lot better, with more chromatic separation between the skin and clothes, but that clearly got changed before production. Anyway, the difference is the head; he's now fully bald, but his nose has grown back, making him less zombie-ish overall. His mouth is closed, and he looks more like a corpse that's been in a coffin than one exposed to the elements - possibly because the eyes, being painted the same color as everything else on him, appear to be closed. Stop napping, Specimen 459, you have humans to eat! Secondly, we have figure #E002, "Specimen 459 (Upper)." This one gets the same new "48 hours later" head, but is missing his entire lower body. There's nothing at all beneath the chest joint! That's not only a smart use of the V-HACKS' modular body style, it also gives us a prime opportunity to use the "severed spinal column" accessory all the zombies have come with so far! It has a socket to plug onto the torso's ball, though the piece doesn't sit as close to the torso as the normal abdomen parts do (it leaves a gap). The edges of skin on it are ragged, and a handful of vertebrae hang down from the exposed musculature. Both these zombies come with the same accessories as the rest: spine stomach, entrail stomach, a human arm, and a display base. They each get their own art card, too, both distinct from the one the standard toy had. It is worth noting that their articulation seems a bit stiffer than the main figures' have been, so that will require a little care. 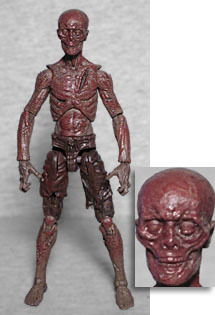 This entry was posted in blog exclusive review, Kickstarter and tagged Vitruvian HACKS, zombies. Bookmark the permalink.